My favorite card out Topps T206 is not one that we pulled in our case break (check it out here), but it was one I found on eBay while searching for auctions. How pretty is this card? Where do you think the auction is going to end? Real question is what are the materials. It says memorabilia, but they could be a piece of seat from Yankee Stadium, and a polo shirt Mickey wore to breakfast ... once. If you look at all the single-swatch, framed jersey/bat cards you pulled, it does say what the swatch is from (i.e. "Game-Used Jersey"). 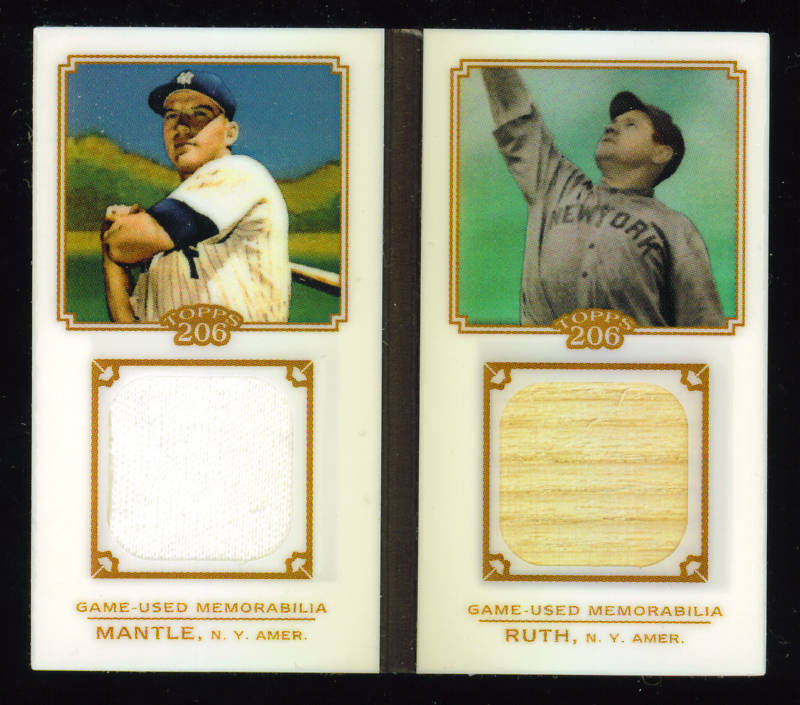 The use of the ambiguous phrase "Game-Used Memorabilia" is definitely a red flag. Matters not what the material is: could be bubble gum and someone will collect it. The important thing to remember about 2010 T206 sets is that there (1)may never be a complete set made, and (2)may never again be as thorough a set as this is again. Topps spared no expense in signing exclusivity agreements with some veterans. This will keep them from appearing much, if not ever, in other sets in the future. This is an abundantly collectible set with some truly limited cards. Harkens back to the original 206, with the old Caramels and Piedmonts, in superb execution of designs and overall scarcity.